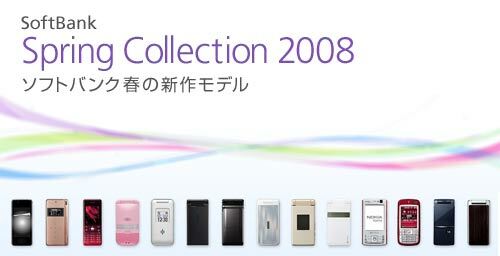 SoftBank Mobile introduced their latest handset line-up for Spring 2008 at a press conference here in Tokyo on Monday afternoon – video in English – with 15 new models announced. With something for everyone on offer they have followed in DoCoMo’s lead of adopting a wide range of GSM roaming enabled units, 7 in all, along with new designs targeted at everyone from children to seniors including all the standard bells and whistles. Several items worth noting include the – better late than never – introduction of Nokia’s N95 into the Japan market and a collaboration with Tiffany for an exclusive designers model. More details after the jump. technique of genuine intention cultivating it by LCD TV "Regza"
(made by Toshiba) Design changing and the second of Codomobail. For "Position Nabis"